The media remind us daily of the national opioid addiction crisis. The CDC indicates that the opioid crisis evolved in 3 waves. Because so much of the opioid crisis involves prescription drugs, pharmacists are concerned and have responsibilities to help curb the crisis. Many pharmacists feel helpless and want to know how to specifically help. Let’s look at the dos and don’ts. Many states have teamed with the Drug Enforcement Administration (DEA) and local public health agencies to establish drug take-back programs. The most common programs are held periodically. States typically advertise the specific date on which patients can bring in prescriptions that are expired or unneeded to locations such as fire or police departments. Know your state’s laws and get training to dispense naloxone without a prescription. Educate patients by offering brochures in multiple languages and reviewing administration techniques. Many federal and state agencies offer these brochures as free downloads. Offering free classes on naloxone is another good outreach effort. Know the situation in your neighborhood and state and be aware of what the scope of practice allows. Some states allow pharmacists to dispense naloxone on a prescription, some let them prescribe naloxone, and some let them enter into consult agreements with physicians to manage patients’ drug therapy. The broadest scope of practice saves lives. Policy makers are crucial to addressing many of the issues underlying the opioid epidemic, such as lack of education, low income, and poor housing.12 Know what legislators are doing about the opioid crisis, and them to voice your opinion or offer suggestions. No one intentionally sets out to become an addict or to overdose. Understand the available treatment options in your neighborhood and publicize them. The FDA offers several free brochures and posters, and your state health department may also. It can be difficult to start conversations with patients about touchy subjects, but pharmacists do it all the time for patients who have chronic illnesses. Addiction is a chronic illness. Step up to the plate, and discuss issues related to addiction with patients in a compassionate, direct manner. 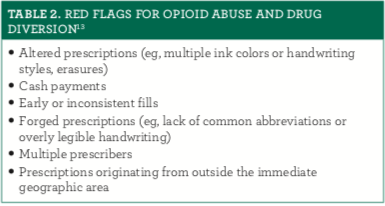 When red flags suggest opioid abuse (table 213), start conversations with patients. That conversation might begin when a pharmacist returns a prescription to a patient or explains why he or she is confiscating a prescription. It is critical to know your state’s law on refusing to fill prescriptions. Although the opioid overdose numbers may be daunting, pharmacists should focus on their role and remember that they can make a difference. Jeannette Y. Wick, RPh, MBA, FASCP, is the assistant director of the Office of Pharmacy Professional Development at the University of Connecticut School of Pharmacy in Storrs. 1. Understanding the epidemic. CDC website. cdc.gov/drugoverdose/epidemic/index. html. Published August 30, 2017. Accessed June 14, 2018. 2. Wide-ranging online data for epidemiologic research (WONDER). CDC website. wonder.cdc.gov. Updated June 27, 2018. Accessed July 3, 2018. 3. Kolodny A, Courtwright DT, Hwang CS, et al. The prescription opioid and heroin crisis: a public health approach to an epidemic of addiction. Annu Rev Public Health.2015;36:559-574. doi: 10.1146/annurev-publhealth-031914-122957. 4. Rudd RA, Aleshire N, Zibbell JE, Gladden RM. Increases in drug and opioid overdose deaths – United States, 2000-2014. MMWR Morb Mortal Wkly Rep.2016;64(50):1378-1382. doi: 10.15585/mmwr.mm6450a3. 5. Drug Enforcement Administration releases new rules on pharmaceutical drug collection [news release]. Columbus, OH: State of Ohio Board of Pharmacy; December 18, 2014. pharmacy.ohio.gov/Documents/Pubs/Special/DrugTakeBack/ Drug%20Enforcement%20Administration%20Releases%20New%20Rules%20 on%20Pharmaceutical%20Drug%20Collection. Accessed June 14, 2018. 6. The National Academies of Science, Engineering, and Medicine. Pain manage- ment and the opioid epidemic. National Academies of Sciences website. nap.edu/ resource/24781/Recs_071317_Opioids. Published July 2017. Accessed June 14, 2018. 7. Product Stewardship Institute; New York Product Stewardship Council. 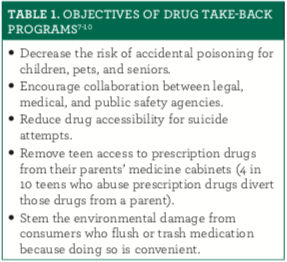 How-to guide for drug take-back: managing a pharmacy-based collection program for leftover household pharmaceuticals. Product Stewardship Institute website. c.ymcdn.com/sites/ www.productstewardship.us/resource/resmgr/pharms_reports_factsheets/160920_ PSI_Pharmacy_Guide_vS. Published September 2016. Accessed June 14, 2018. 8. Elements Behavioral Health. New law lets pharmacies take back unused prescrip- tion drugs. Elements Behavioral Health website. elementsbehavioralhealth.com/ addiction/new-law-lets-pharmacies-take-back-unused-prescription-drugs/. Published September 9, 2014. Accessed June 14, 2016. 9. Lessons learned: voluntary pharmaceutical take-back programs in the great lakes state. Product Stewardship Institute website. c.ymcdn.com/sites/productstewardship. site-ym.com/resource/resmgr/Infographics_Fact_Sheets/2013.09.27_GLRI_Lessons_ Lear. Accessed June 14, 2018. 10. Drug Take Back Program. Military Health System website. health.mil/Military- Health-Topics/Access-Cost-Quality-and-Safety/Access-to-Healthcare/Pharmacy- Program/Drug-Take-Back-Program?type=Articles. Accessed June 14, 2018. 11. Prescription Drug Abuse Policy System. Naloxone overdose prevention laws. Prescription Drug Abuse Policy System website. pdaps.org/datasets/laws-regulat- ing-administration-of-naloxone-1501695139. Updated July 1, 2018. Accessed July 3, 2018.
and economic determinants. Am J Public Health. 2018;108(2):182-186. doi: 10.2105/ AJPH.2017.304187. 13. Pharmacists: on the front lines. Addressing prescription opioid abuse and overdose. CDC website. cdc.gov/drugoverdose/Pharmacists_Brochure-a. Accessed June 14, 2018.